In the summer of 1985, Yoshiko Okamura came to the U.S. as an Ayusa high school exchange student. 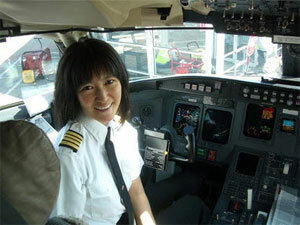 She stayed with a warmhearted host family, attended an American high school, encountered new friends, and returned to Japan with a wealth of knowledge.She later returned to the U.S. where she realized her dream of becoming a pilot. In May of 1995, she was employed by Horizon Airlines, receiving recognition as one of their highest achievers. On June 12th, she made history as the first Japanese female commercial aircraft pilot when she flew the Horizon Air Dash 8.She now lives in Washington and continues her success as a pilot. I studied abroad in the state of Indiana. When I arrived at the airport, I was welcomed by my host family, the Michaels, who were all dressed in jeans and t-shirt with friendly smiles across their faces. Tom, the father worked as a lawyer and Linda, the mother was a French teacher. Their daughter Jenny was a freshman in college and they had a son named Ned who was a high school student two years younger than me.Rather than going home from the airport, the Michael family took me straight to local children's museums and fairs. The fair was a rural event where local farmers brought their farm animals - cows, pigs and chickens and had shows to see who had the best livestock. Deep-fried snacks were sold at the food booths and they were nearly the size of an elephant's ear.As a native of Tokyo, I felt a small degree of culture shock being immersed in a rural community where amusement involved a show of cows and pigs, but I also remember feeling delighted and joyful at the same time. Attending High School in the U.S. I attended Marion High School which was about 15 minutes by car from my host family's home. The town of Marion, Indiana is known to be the birthplace of the famous James Dean. Unlike a Japanese school, the American school allowed you to create your own curriculum and choose your own courses. I chose drama, typewriting, P.E., and my strong subject, mathematics. In order to learn more about Indiana and the U.S., I enrolled in social studies. I was driven by the motivation to "do everything" so I also participated as a cheerleader for the basketball team. The Michael family was an upper class family, however, the United States is a country that has a gap between poverty and wealth. I spent one night at a friend's house whose family received government financial aide. Her mother told me, "Although we are poor, there is a lot of love in this family." I clearly remember her words to this day.Perhaps because Indiana was still quite rural when I attended high school, the influence of segregation still remained so much that the cafeteria would naturally divide by race - African Americans in one section and Caucasians in another section. Seeing this reality, I understood the various levels of living circumstances and hardships that existed in the U.S. Although I continued high school in Japan following the study abroad program, I decided to attend college in the U.S. to pursue a career as a flight attendant, and that was when I returned to live with the Michael Family once again.One day, my host father Tom took me to an air show and I met a female pilot. I told her about how I wanted to become a pilot and she said to me, "Don't give up. You can do it if you try hard." Her words of encouragement re-inspired my dream of becoming a pilot. After intense studies throughout college and following my successful graduation from aviation school, I flew for the first time at Hiser Aviation, which is a pilot training center in the Los Angles area. In June of 1995, I began working with Horizon Air as a commercial aircraft pilot. Horizon Air had 650 pilots total, only 10 of which were female.When I entered Horizon Air, I was recognized as one of the highest achievers of the time. I still remember when the training captain said to me, "Yoshiko, I have never met anyone as accomplished as you, and your technique is flawless!" I am extremely grateful that I pursued my dream of becoming a pilot; I never gave up. Time flies very quickly, and it is now 25 years since I was a high school exchange student. When I look back at the past, I realize that my dreams and inspirations developed through the relationships I built with my host family, my friends and the community.Japan and the U.S. each has its own unique culture. It is important not to become confined in your own thought and to actively engage in understanding the country you find yourself in. The most valuable thing I learned from studying abroad is that the U.S. is a place where those who have the ambition to achieve their dreams have many opportunities and that there are people who will support you. I had dreamt of becoming a pilot since age four, and I was able to make my dream come true! A message to all - Take hold of your dream and make the most of your opportunity to study abroad in the U.S.